first UK exhibition to close the loop on single use cups. 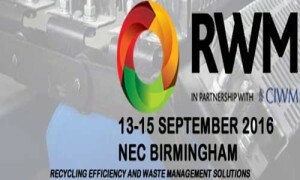 RWM 2016 will be leading the way – becoming the first exhibition in the UK to recycle 100% of cups at the event in Birmingham, 13 – 15 September. RWM are working in partnership with Simply Cups to ensure that all cups that are used during the exhibition are collected and recycled. An additional 74 waste points will be on site which are specially designed to separate and collect liquid waste and the used cups. This creates many touch point opportunities for visitors and exhibitors to conveniently dispose of their cups after use. Simply Cups, a partnership between Simply Waste Solutions and Closed Loop Environmental Solutions, is the UK’s ONLY collection and recycling service dedicated to turning paper and plastic cups into second-life material. Providing the materials are placed in separate bins, Simply Cups can collect and recycle paper cups, plastic cups and cup lids. Nicola Meadows, event director said “Top campaigners to industry associations, the hospitality sector and the public are all demanding more to be done to close the loop on single use coffee cups. We feel the RWM event is the perfect place to lead the way for future exhibitions in the UK. As event organisers, it is imperative that we not only deliver a show with great content on recycling solutions and resource efficiency, but that we also ensure our operations are aligned with these goals.